Rev. 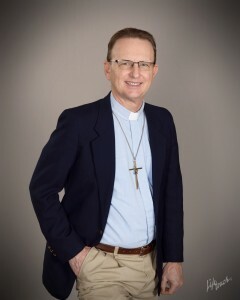 Glenn A. Meyer has served as sole pastor for the past nine years. He was ordained in Katy, Texas in June, 2004. He was installed as Pastor of Trinity Lutheran Church in McAlester, Oklahoma on June 27, 2004. Pastor Glenn’s wife is Loretta and their sons are Joshua (21) and Christopher (19). He completed his Master of Divinity degree May, 2003. To enrich his pastoral care skills, especially in the area of counseling, he did a full year (four units) of Clinical Pastoral Education (CPE). His first unit was during the summer of 2003 as a chaplain intern at Barnes-Jewish Hospital, St. Peter’s. After that, he completed three units (Sept. 2003 — May 2004) as a chaplain intern at Lutheran Convalescent Home in St. Louis. Ministry strengths for Pastor Glenn include family ministry and counseling, cross-cultural mission and evangelism, and administration. His vicarage congregation was Concordia Lutheran Church in Bourbon, Missouri. Glenn’s recreational interests include hunting, fishing, sailing, disc golf, ball golf, tennis, racquetball, mountain biking, and playing trumpet. Our Banner Statement: Not perfect, just forgiven. Our Vision: We are Christians of the Lutheran church inspired to follow Christ, sharing His forgiveness and salvation. Families gathering around the church – game nights, sports, cooking, etc. Directions: Trinity is located off the Hwy. 31 exit from Hwy 270 east of Hwy 69. It is just up the hill from His Place Christian Community Center. Office hours are Tuesday through Friday from 9:00 a.m. until 1:00 p.m.